Kathryn McGarry was sworn in as the new mayor of the City of Cambridge. After the ceremony, Mayor McGarry addressed City Council and others present. Good Evening. Thank you all for being here for the Inaugural meeting of this new term of Council. I offer warm congratulations to all Councilors on your re-election. You have shown yourselves to be committed to public service and the residents in Cambridge have shown their confidence in you. It takes courage and conviction to put your name on a ballot. Welcome to your family and friends who are here to celebrate with you this evening. And welcome and thanks to my husband, my children, my father and my family for your love and encouragement. We thank all of you for the support you give to us. Acknowledging the people who have helped me in my election campaign is almost daunting, as there are not enough ways to say “thank you”. It is all of your efforts, hope and unwavering friendship that continue to inspire me every day, to become the best Representative of Cambridge that I can be. You will ensure that I will serve all of our communities, recognizing that those who hold differing viewpoints are our friends and neighbours. Indeed, having open debate in this Chamber is a privilege I hold dear, and a responsibility I believe we all readily assume to serve all the citizens of our community. I want to extend a sincere thank you to Doug Craig for his service and sacrifices in representing Cambridge citizens for so many years, including 18 years as Mayor. All of us here understand what it is like to put lives on hold for public office. We offer our deepest gratitude to his wife Ginny and his family for sharing Doug with us, compromising family time so he could serve our residents. We wish him the very best in the future. Cambridge is a great city with a bright and promising future. I have always been captivated by the natural beauty of Cambridge especially the Speed and Grand Rivers that run though the city’s core. The confluence of these two rivers is near the village of Blair, the oldest inland settlement in Ontario, founded in 1800 by the Pennsylvania Dutch settlers. These lands were once the summer home of the Neutral indigenous peoples. The Grand River was designated as a National Heritage River in 1994. Bald eagles and rare species now inhabit the shores of these rivers. Cambridge also boasts a rich architectural heritage, with many early stone and brick buildings along the riverbanks, downtown cores and residential tree lined streets. Many trails connect our community with beautiful landscapes and riverscapes to enjoy while walking or cycling. The heritage buildings and rivers are important elements in Cambridge’s economic history as they draw many to our downtown cores, boosting tourism and the local economy. The City gains revenues from the filming of many movies due to the historic settings. We need to support and build up our three unique downtown cores and work with our three Business Industry Associations to help their efforts. By embracing our heritage and our trails, we can work to increase cycling opportunities as it is one of the fastest growing sectors of Ontario’s tourism market and could benefit our downtown core areas, attracting new investment and opportunities. Our shared vision for a healthy, safe, connected and prosperous Cambridge will be achieved by working together to solve the challenges in front of us while at the same time, capitalizing on our community’s enormous potential. Cambridge needs its Mayor, Council and city staff to work well together as a team; a team that delivers results for the people of Cambridge. From the conversations I’ve already had with my fellow councilors and staff – I know we can do this. I want to actively listen to and engage the public and Council, work to build consensus, and act to deliver a result that benefits our community. Planning regular, open town hall meetings in every Ward with the Ward Councilor will improve communication between City Hall and our community. More involvement from our multicultural community, seniors, youth, and those with intellectual and physical disabilities will make sure everyone feels included our community. This will result in a more open, transparent, and ultimately cost-effective, decision-making process for all of us. As your past Member of Provincial Parliament, I was able to get important investments for our community. As a member of Cabinet, I championed local issues including investments in our nuclear and our auto industry and improved transportation and public transit; investments that secured important local jobs right here in Cambridge. My history of working with all levels of government means that I have significant relationships with people who are in a position to invest in our community’s future. These relationships matter and are at the root of positive progress. I want to ensure Cambridge has a good reputation and is recognized as a leader and innovator. It will be those relationships - and new ones we build – that will help us ramp up our economic development. We want to continue working with local businesses, the Chamber of Commerce, all levels of Government and the regional Economic Development Corporation to attract and establish leading companies here in our city and ensure businesses that we have here have the tools they need to grow and expand including improved transit options. We can attract and develop top tier talent here in Cambridge so they can join the leading organizations in Cambridge like Toyota, ATS, BWXT, eSentire, to name a few. As your Mayor I want to actively promote Cambridge to Ontario, Canada and international markets and bring new investment and opportunities here. Cambridge has so many things to offer prospective businesses. We are a centre of excellence in the nuclear supply chain and advanced manufacturing sector. We have excellent post-secondary education facilities here with Conestoga College and the School of Architecture that continue to foster local talent and partnerships that contribute to a skilled workforce. And that is growing our participation in the tech corridor. Conestoga’s Applied Research Hub in the newly opened Grand Innovations is focused on advanced manufacturing, cybersecurity and advanced recycling, for example. The students are enthusiastic and excited to research innovative solutions for the companies they are partnered with. And many new start-up companies have also set up in Grand Innovations in the Gaslight District, an exciting way to revitalize the downtown core and breathe new life into a renovated heritage industrial building. Cambridge’s very foundations were built around innovation and ingenuity and we continue to build on that. Together, we will continue to build a climate that attracts entrepreneurs, new restaurants, new businesses as well as arts and culture; a livable and vibrant City for residents of all ages. One that has a focus on making sure our children are thriving and have opportunities to help them be the best they can be, and a focus on prevention for those that are at risk. The future of Cambridge does not rest with the Mayor alone, but in the Mayor’s ability to work with City Council in collaboration together with Regional council and others to achieve a great deal; focused on the shared priority of a healthy, safe Cambridge. Our City is suffering from the effects of a complex and national opioid epidemic. We need solutions that balance the needs of our marginalized and homeless individuals with the needs of our business and residential communities. Our shared priority is to increase the supply of affordable and supportive housing and to work with the Cambridge Shelter Corporation, to help find a new location for the Bridges shelter and to work with social services, police and others to improve and wrap around addiction, mental health, prevention and employment services to help address this long term issue. Cambridge Memorial Hospital’s expansion is almost completed, but the delay has been very frustrating for all of us. As Mayor, I will continue to work closely with CEO Patrick Gaskin and all the partners to complete the new wing and move forward as fast as possible. Our community deserves it. I will use every ounce of my energy, experience and passion to bring people together to solve the issues facing our great city. Fighting for Cambridge and its people has been my life’s greatest privilege. I am excited at the opportunity to continue serving my community. 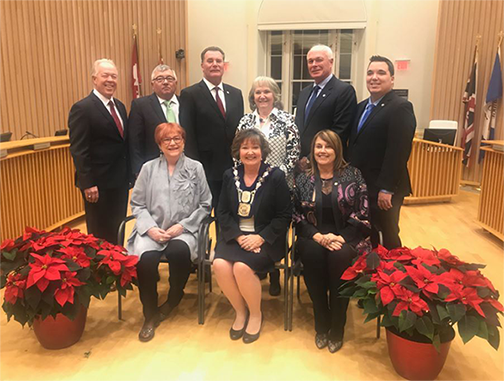 It is a privilege to be in public service, and it will be my honour to serve our community as your Mayor, along with Councillors Donna Reid, Mike Devine, Mike Mann, Jan Liggett, Pam Wolf, Shannon Adshade, Frank Monteiro, and Nicholas Ermeta. It’s going to be a great four years!